Nearly 7,000 people registered for this year’s Nation's Triathlon. That could be a record! The Olympic-distance triathlon Sunday morning includes a 1.5 kilometer swim in the Potomac River, 40 kilometer bike course through downtown and a 10 kilometer run that ends on the banks of the Potomac River next to the Tidal Basin. The first wave started hit the water at 7 a.m. Robert Wade, 28 of Arlington, won among the men, with a final time of 1:57:13. The leading woman was Peggy Yetman, 42, of Leesburg, Va., with a time of 2:07:20. Mayor Adrian Fenty finished in 67th place in the elite division, with a time of 2:45:57. In the third annual CQ-Roll Call Group Congressional Challenge, more than 400 competitors from Capitol Hill and the federal government competed in a "race within a race." The winner among men was Juan Valdivieso, 29, from the office of Sen. Patrick Leahy, with a time of 2:07:04. The female winner was Amy Adcock, 41, of the FBI, with a time of 2:27:36. The event raised more than $3 million for the Leukemia and Lymphoma Society this year. Organizers say they could be recognized by the Guinness Book of World Records as the largest Olympic/International distance triathlon event in the country. That would beat the record 3,731 people at the Accenture Chicago Triathlon in Chicago in August 2006. The Nation's Triathlon started in 2006, but river conditions prevented participants from swimming in the first two years. 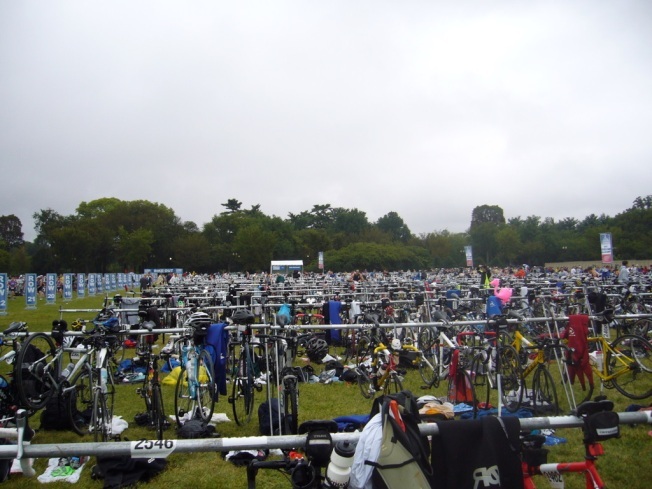 Do you have pics of the Nation's Triathlon? Send them to isee@nbcwashington.com!